Recommended - Dual Sockets/Quad core server with 16 GB RAM, 50 GB free disk space on multiple disk spindles and 1 Gbps network interface. For the Red Hat Enterprise Linux 6 operating system: minimum 1 GB RAM and 5 GB local disk space. If you wish to create an ISO domain on the Manager server, you need minimum 15 GB disk space. 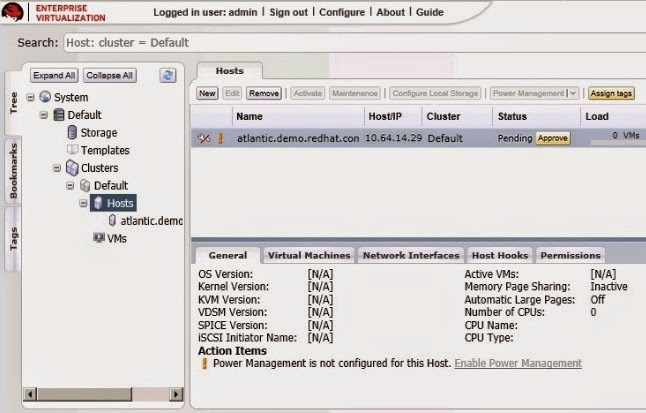 The Red Hat Enterprise Virtualization Manager (v.3 x86_64 ) channel, also referred to as rhel-x86_64 -server-6-rhevm -3, which provides Red Hat Enterprise Virtualization Manager. The JBoss Application Platform (v 5) for 6Server x86_64 channel, also referred to as jbappplatform -5-x86_64 -server-6-rpm , which provides the supported release of the application platform on which the manager runs. The RHEL Server Supplem entary (v. 6 64 -bit x86_64 ) channel, also referred to as rhel-x86_64 -server-supplem entary-6, which provides the supported version of the Java Runtime Environment (JRE). A client for connecting to Red Hat Enterprise Virtualization Manager. Minimum - Dual core server, 10 GB RAM and 10 GB Storage, 1 Gbps network interface. Recommended - Dual socket server, 16 GB RAM and 50 GB storage, two 1 Gbps network interfaces. For each host: AMD-V or Intel VT enabled, AMD64 or Intel 64 extensions, minimum 1 GB RAM, 3GB free storage and 1 Gbps network interface. For virtual machines running on each host: minimum 1 GB RAM per virtual machine. Valid Red Hat Network subscriptions for each host. You can use either Red Hat Enterprise Virtualization Hypervisor or Red Hat Enterprise Linux hosts, or both. For each Red Hat Enterprise Virtualization Linux host: The Red Hat Enterprise Virt Management Agent (v 6 x86_64 ) channel, also referred to as rhel-x86_64 -rhevmgm t-agent-6. At leasTone of the supported storage types (NFS, iSCSI and FCP). For NFS storage, a valid IP address and export path is required. 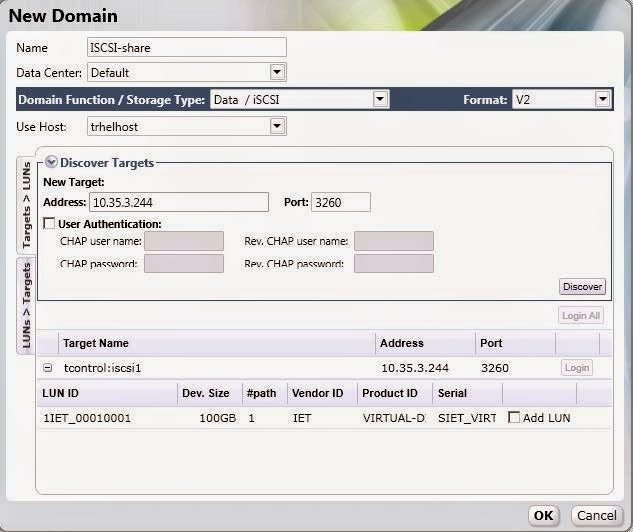 For iSCSI storage, a valid IP address and target information is required. Static IP addresses for the Red Hat Enterprise Virtualization Manager server and for each host server. DNS service which can resolve (forward and reverse) all the IP addresses. An existing DHCP server which can allocate network addresses for the virtual machines. Installation images for creating virtual machines, depending on which operating system you wish to use. Microsoft Windows XP, 7, 2003 or 2008. Red Hat Enterprise Linux 3, 4, 5 or 6. Valid licenses or subscription entitlements for each operating system. A Red Hat Enterprise Linux client running Mozilla Firefox 3.6 and higher or a Windows client running Internet Explorer 7 and higher. The Red Hat Enterprise Virtualization platform consists of at leasTone Manager and one or more hosts. 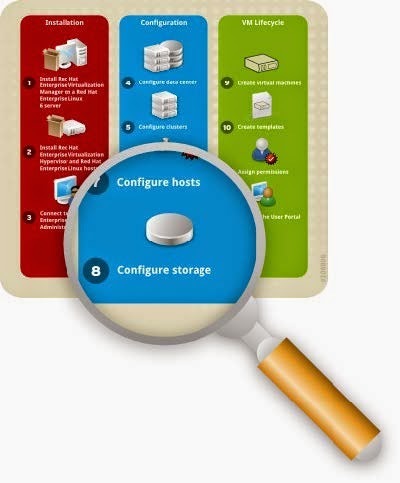 The Manager is the control center of the Red Hat Enterprise Virtualization environment. It allows you to define hosts, configure data centers, add storage, define networks, create virtual machines, manage user permissions and use templates from one central location. Enterprise Linux 6, with minimum 4 GB RAM, 25 GB free disk space and 1 Gbps network interface. password. Follow the onscreen prompts to complete registration of the system. Reboot your server for the updates to be applied. Subscribe the server to the required channels using the Red Hat Network web interface. a. Log on to Red Hat Network (http://rhn.redhat.com/). b. Click System s at the top of the page. by clicking the name of the system. e. Select the following channels from the list presented on the screen. Note: rhevm -setup supports the en_US.UT F-8, en_US.utf8, and en_US.utf-8 locales. are stated in [ ] brackets. You can let the installer configure iptables autom atically overriding the current configuration. The old configuration will be backed up. The default ports 8080 and 84 4 3 must be available to access the manager on HTTP and HTTPS respectively. If you elect to configure an NFS share it will be exported from the machine on which the manager is being installed. The storage type that you select will be used to create a data center and cluster. You will then be able to attach storage to these from the Administration Portal. Enterprise Virtualization supports IPA and Active Directory, and provides a utility called rhevmmanage-domains to attach new directories to the system. Virtualization Hypervisor or Red Hat Enterprise Linux as hosts. This document provides instructions for installing the Red Hat Enterprise Virtualization Hypervisor using a CD. For alternative methods including PXE networks or USB devices, see the Red Hat Enterprise Linux Hypervisor Deployment Guide. 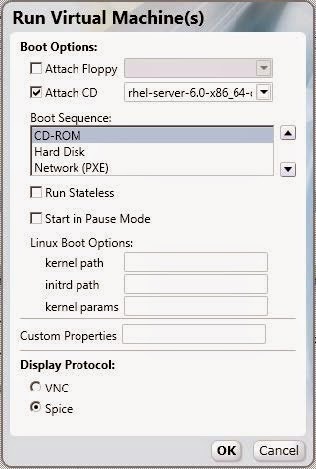 Before installing the Red Hat Enterprise Virtualization Hypervisor, you need to download the hypervisor image from the Red Hat Network and create a bootable CD with the image. This procedure can be performed on any machine running Red Hat Enterprise Linux. Virtualization Manager is installed by clicking on its name. d. Click Alter Channel Subscriptions in the Subscribed Channels section of the screen. 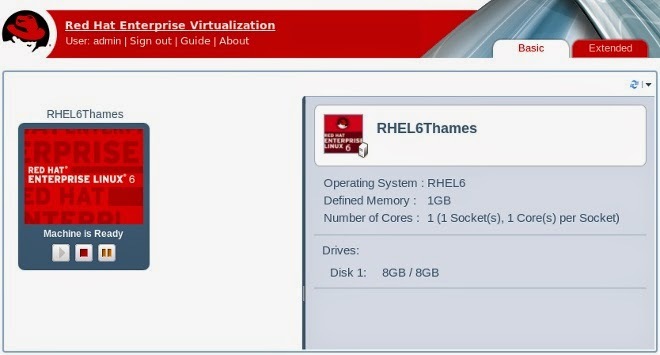 e. Select the Red Hat Enterprise Virtualization Hypervisor (v.6 x86_64 ) channel from the list presented on the screen, then click the Change Subscription button to finalize the change. # yum install "rhev-hypervisor* "
The hypervisor ISO image is installed into the /usr/share/rhev-hypervisor/ directory. Use the Up and Down arrow keys to navigate between selections. Your selections are highlighted in white. The T ab key allows you to move between fields. with an asterisk (* ). To proceed with the selected configurations, press the Enter key. select Boot to boot from the hypervisor installation media. Press Enter. On the installation confirmation screen, select Install RHEV Hypervisor and press Enter. use the arrow keys to select the correct disk. Select Continue and press Enter. You are prompted to confirm your selection of the local drive, which is marked with an asterisk. confirm. Remove the installation disc. keys to navigate between the tabs and Enter to access them. HostName: Enter the hostname in the formaTof hostName.Dmain.example.com . DNS Server: Enter the Domain Name Server address in the formaTof 192.168.0.254 . You can use up to two DNS servers. NTP Server: Enter the Network T ime Protocol server address in the formaTof rhel.pool.ntp.org. This synchronizes the hypervisor's system clock with thaTof the manager's. You can use up to two NTP servers. Select Apply and press Enter to save your network settings. 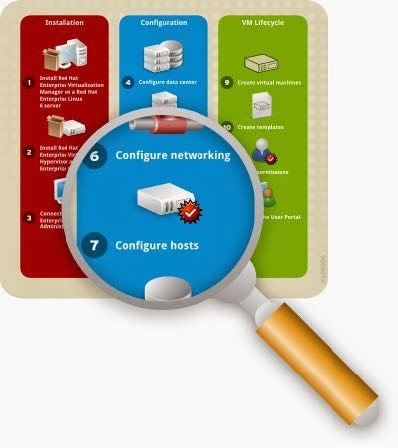 The installer automatically detects the available network interface devices to be used as the management network. Select the device and press Enter to access the interface configuration menu. Under IPv4 Settings, tick either the DHCP or Static checkbox. If you are using static IPv4 network configuration, fill in the IP Address, Netm ask and Gateway fields. To confirm your network settings, selecToK and press Enter. Managem ent Server: Enter the Red Hat Enterprise Virtualization Manager domain name in the formaTof rhevm .dem o.redhat.com. Management Server Port: Enter the management server port number. The default is 8443. Connect to the RHEV Manager and Validate Certificate: Tick this checkbox if you wish to verify the RHEVM security certificate. Set RHEV-M Adm in Password: This field allows you to specify the root password for the hypervisor, and enable SSH password authentication from the Red Hat Enterprise Virtualization Manager. Select Apply and press Enter. A dialog displays, asking you to connect the hypervisor to the Red Hat Enterprise Virtualization Manager and validate its certificate. Select Approve and press Enter. A message will display notifying you that the manager configuration has been successfully updated. Under the Red Hat Network tab, you can register the host with the Red Hat Network. Enter your Red Hat Network credentials in the Login and Password fields. To select the method by which the hypervisor receives updates, tick either the RHN or Satellite checkboxes. Fill in the RHN URL and RHN CA fields. To confirm your RHN settings, select Apply and press Enter. procedure if you wish to use more hypervisors. The following sections will provide instructions on how to approve the hypervisors for use with the Red Hat Enterprise Virtualization Manager. 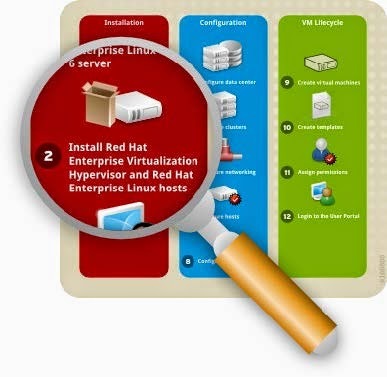 You now know how to install a Red Hat Enterprise Virtualization Hypervisor. In addition to hypervisor hosts, you can also reconfigure servers which are running Red Hat Enterprise Linux to be used as virtual machine hosts. Linux 6.2. SelecTonly the Base package group during installation. If your server has not been registered with the Red Hat Network, run the rhn_register command as root to register it. To complete registration successfully you will need to supply your Red Hat Network username and password. Follow the onscreen prompts to complete registration of the system. Log on to Red Hat Network (http://rhn.redhat.com/). You have now successfully installed a Red Hat Enterprise Linux host. As before, repeat this procedure if you wish to use more Linux hosts. 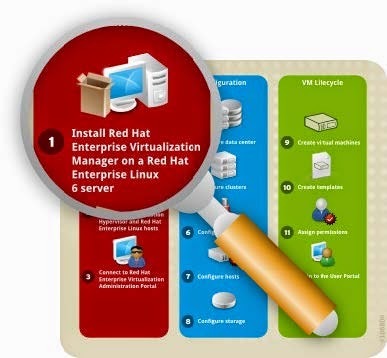 Before you can start running virtual machines on your host, you have to manually add it to the Red Hat Enterprise Virtualization Manager via the administration portal, which you will access in the next step. Now that you have installed the Red Hat Enterprise Virtualization Manager and hosts, you can log in to the Manager administration portal to start configuring your virtualization environment. The web-based administration portal can be accessed using a Windows client running Internet Explorer. Before logging in, install .NET Framework 4 and modify the default security settings on the machine used to access the web administration portal. The example below is applicable for Windows 2008.
http://www.microsoft.com/download/en/details.aspx?id=17718. Run this executable as a user with administration access to the system. Tools → Server Manager. On the Security Inform ation pane in the Server Manager window, click Configure IE ESC. 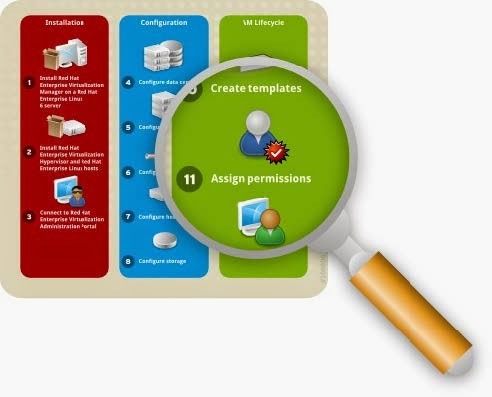 SelecToff for Administrators and Users to disable the security configuration. Click OK.
Tools → InterneToptions. Click on the Security tab. Select Trusted Sites. Click Sites to display the T rusted Sites dialog. Enter the URL for your administration portal in the Add this website to the zone textbox. Click Add, then Close. Click the Custom Level... button. Locate the XAML browser applications item in the list, ensure that it is set to Enable, then click OK. Restart Internet Explorer to access the administration portal. installation as instructed in Example, “Red Hat Enterprise Virtualization Manager installation”. Open a browser and navigate to https://Dmain.exam ple.com :84 4 3/RHEVManager. Substitute Dmain.exam ple.com with the URL provided during installation. Manager will issue security certificates for your browser. Click the link labelled this certificate to trust the ca.cer certificate. A pop-up displays, click Open to launch the Certificate dialog. Click Install Certificate and select to place the certificate in Trusted Root Certification Authorities store. Back on the browser screen, click the link labelled here and follow the prompts to install the RHEV-GUI-CertificateInstaller executable. A pop-up displays again, this time click Run. Note that the actual certificate installation is preceded by an ActiveX installation. When complete, a new link labelled here appears. Click on it to reload the administration portal. that you provided during installation. Ensure that your domain is set to Internal. Click Login. Navigation Pane: This pane allows you to navigate between the Tree, Bookmarks and Tags tabs. In the Tree tab, tree mode allows you to see the entire system tree and provides a visual representation your virtualization environment's architecture. Resources Tabs: These tabs allow you to access the resources of Red Hat Enterprise Virtualization. You should already have a Default Data Center, a Default Cluster, a Host waiting to be approved, and available Storage waiting to be attached to the data center. action button. If an action is not possible, the button is disabled. Details Pane: When you select a resource, this pane displays its details in several subtabs. Once you are familiar with the layouTof the administration portal, you can start configuring your virtual environment. Now that you have logged in to the administration portal, configure your Red Hat Enterprise Virtualization environment by defining the data center, host cluster, networks and storage. 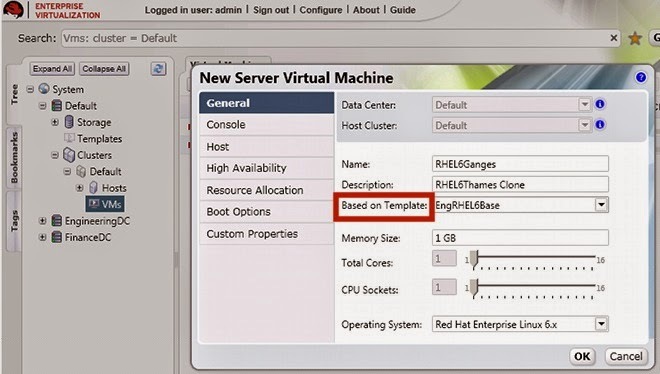 Even though this guide makes use of the default resources configured during installation, if you are setting up a Red Hat Enterprise Virtualization environment with completely new components, you should perform the configuration procedure in the sequence given here. A data center is a logical entity that defines the seTof physical and logical resources used in a managed virtual environment. Think of it as a container which houses clusters of hosts, virtual machines, storage and networks. By default, Red Hat Enterprise Virtualization creates a data center at installation. Its type is configured from the installation script. To access it, navigate to the Tree pane, click Expand All, and select the Default data center. On the Data Centers tab, the Default data center displays. 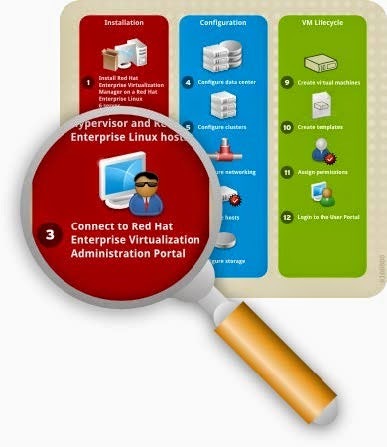 see the Red Hat Enterprise Virtualization Administration Guide. A cluster is a seTof physical hosts that are treated as a resource pool for a seTof virtual machines. Hosts in a cluster share the same network infrastructure, the same storage and the same type of CPU. They constitute a migration domain within which virtual machines can be moved from host to host. 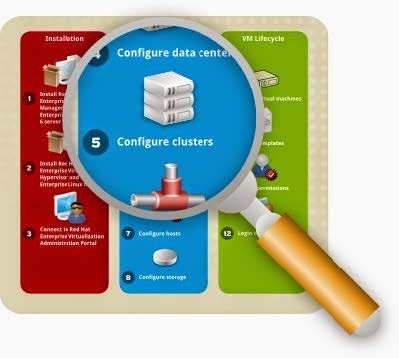 By default, Red Hat Enterprise Virtualization creates a cluster at installation. For this document, the Red Hat Enterprise Virtualization Hypervisor and Red Hat Enterprise Linux hosts will be attached to the Default host cluster. If you wish to create new clusters, or live migrate virtual machines between hosts in a cluster, see the Red Hat Enterprise Virtualization Evaluation Guide. 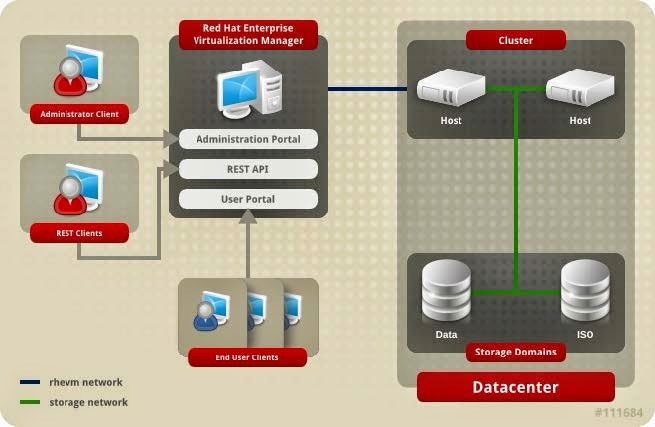 At installation, Red Hat Enterprise Virtualization defines a Management network for the default data center. This network is used for communication between the manager and the host. New logical networks - for example for guest data, storage or display - can be added to enhance network speed and performance. All networks used by hosts and clusters must be added to data center they belong to. To access the Management network, click on the Clusters tab and select the default cluster. Click the Logical Networks tab in the Details pane. The rhevm network displays. The rhevm Management network is used for this document, however if you wish to create new logical networks see the Red Hat Enterprise Virtualization Administration Guide. The Hypervisor you installed in Section “Install Red Hat Enterprise Virtualization Hypervisor” is automatically registered with the Red Hat Enterprise Virtualization platform. It displays in the Red Hat Enterprise Virtualization Manager, and needs to be approved for use. On the Tree pane, click Expand All and select Hosts under the Default cluster. On the Hosts tab, select the name of your newly installed hypervisor. or make changes as necessary, then click OK. The host status will change from Non Operational to Up. “Install Red Hat Enterprise Linux Host” is not automatically detected. It has to be manually attached to the Red Hat Enterprise Virtualization platform before it can be used. The New Host dialog displays. Data Center: the data center to which the host belongs. Select the Default data center. Host Cluster: the cluster to which the host belongs. 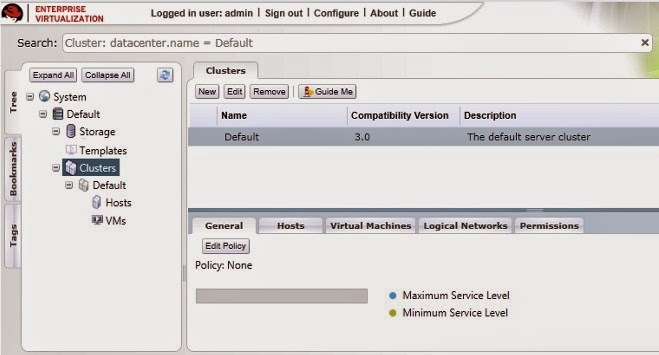 Select the Default cluster. Name: a descriptive name for the host. Address: the IP address, or resolvable hostname of the host, which was provided during installation. Root Password: the password of the designated host; used during installation of the host. 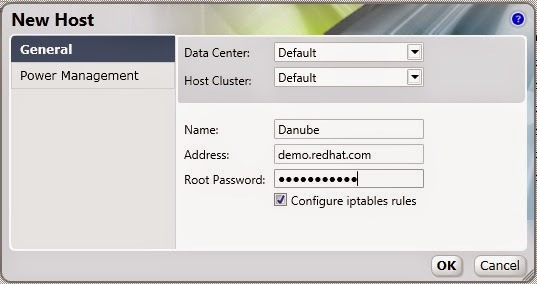 Configure iptables rules: This checkbox allows you to override the firewall settings on the host with the default rules for Red Hat Enterprise Virtualization. Address: The address of the host. User Name: A valid user name for the OOB management. Password: A valid, robust password for the OOB management. Type: The type of OOB management device. Select the appropriate device from the drop down list. Options: Extra command line options for the fence agent. Detailed documentation of the options available is provided in the man page for each fence agent. Click the Test button to test the operation of the OOB management solution. If you do not wish to configure power management, leave the Enable Power Management checkbox unmarked. Click OK. If you have not configured power management, a pop-up window prompts you to confirm if you wish to proceed without power management. SelecToK to continue. The new host displays in the lisTof hosts with a status of Installing. Once installation is complete, the status will update to Reboot and then Awaiting. When the host is ready for use, its status changes to Up. You have now successfully configured your hosts to run virtual machines. The next step is to prepare data storage domains to house virtual machine disk images. 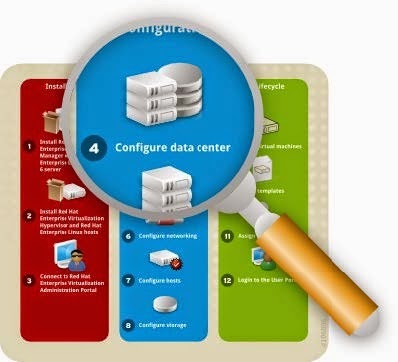 After configuring your logical networks, you need to add storage to your data center. installation as described in Section, “Install Red Hat Enterprise Virtualization Manager”. Ensure that you use the same type when creating your data domain. the results list, the Default data center displays. On the results list, the Storage T ype column displays the type you should add. 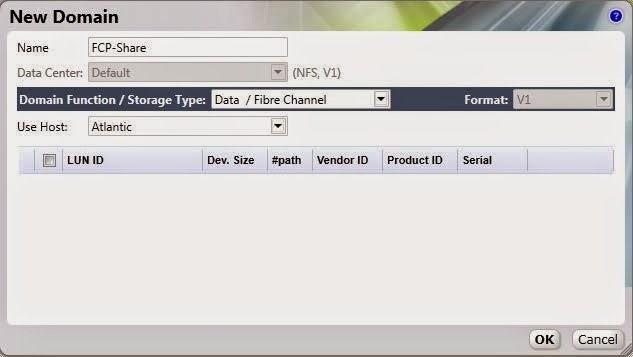 For NFS storage, refer to Section, “Create an NFS Data Domain”. 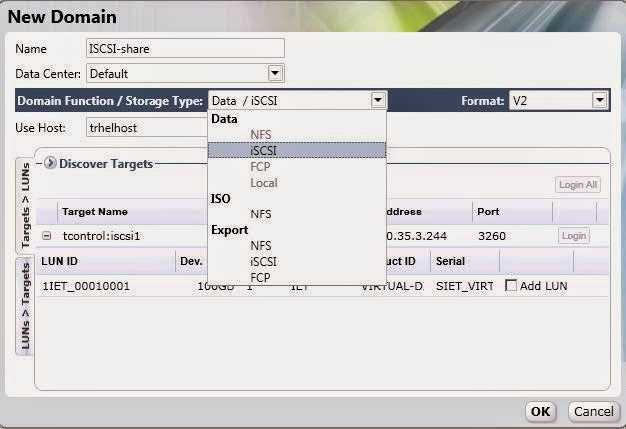 For iSCSI storage, refer to Section, “Create an iSCSI Data Domain”. For FCP storage, refer to Section, “Create an FCP Data Domain”. attached to a data center and used to provide storage for virtual machine disk images. The New Storage dialog box displays. Name: Enter a suitably descriptive name. Data Center: The Default data center is already pre-selected. Dmain Function / Storage T ype: In the drop down menu, select Data → NFS. The storage domain types not compatible with the Default data center are grayed out. After you select your domain type, the Export Path field appears. Use Host: Select any of the hosts from the drop down menu. Only hosts which belong in the pre-selected data center will display in this list. Click OK. The new NFS data domain displays on the Storage tab. It will remain with a Locked status while it is being prepared for use. When ready, it is automatically attached to the data center. and upload installation images so you can use them to create virtual machines. Proceed to Section, “Attach and Populate ISO domain”. Because you have selected iSCSI as your default storage type during the Manager installation, you will now create an iSCSI storage domain. Red Hat Enterprise Virtualization platform supports iSCSI storage domains spanning multiple pre-defined Logical Unit Numbers (LUNs). display on the results list. Click New Domain. The New Dmain dialog box displays. Domain Function / Storage Type: In the drop down menu, select Data → iSCSI. The storage domain types which are not compatible with the Default data center are grayed out. After you select your domain type, the Use Host and Discover T argets fields display. Use host: Select any of the hosts from the drop down menu. Only hosts which belong in this data center will display in this list. display further connection information fields. Address: Enter the address of the iSCSI target. Port: Select the port to connect to. The default is 3260. User Authentication: If required, enter the username and password. Login button for each target. LUN as the iSCSI data domain. and upload installation images so you can use them to create virtual machines. Proceed to Section ,“Attach and Populate ISO domain”. now create an FCP storage domain. Red Hat Enterprise Virtualization platform supports FCP storage domains spanning multiple pre-defined Logical Unit Numbers (LUNs). Domain Function / Storage Type: Select FCP. Use Host: Select the IP address of either the hypervisor or Red Hat Enterprise Linux host. The lisTof existing LUNs display. On the selected LUN, tick the Add LUN checkbox to use it as the FCP data domain. You have defined your first storage domain to store virtual guest data, now it is time to configure your second storage domain, which will be used to store installation images for creating virtual machines. You have already created a local ISO domain during the installation of the Red Hat Enterprise Virtualization Manager. To use this ISO domain, attach it to a data center. the Default data center displays. On the details pane, select the Storage tab and click the Attach ISO button. The Attach ISO Library dialog appears with the available ISO domain. Select it and click OK.
as the domain is being validated, then changes to Inactive. Media images (CD-ROM or DVD-ROM in the form of ISO images) must be available in the ISO repository for the virtual machines to use. To do so, Red Hat Enterprise Virtualization provides a utility that copies the images and sets the appropriate permissions on the file. The file provided to the utility and the ISO share have to be accessible from the Red Hat Enterprise Virtualization Manager. is accessible from the Red Hat Enterprise Virtualization Manager server. You will be prompted for the admin user password again, provide it and press Enter. Note that the uploading process can be time consuming, depending on your storage performance. Navigate to the Tree and click the Expand All button. Under Storage, click on the name of the ISO domain. It displays in the results list. Click on it to display its details pane. On the details pane, select the Im ages tab. The lisTof available images should be populated with the files which you have uploaded. In addition, the RHEV-toolsSetup.iso and virtio-win.vfd images should have been automatically uploaded during installation. Now that you have successfully prepared the ISO domain for use, you are ready to start creating virtual machines. 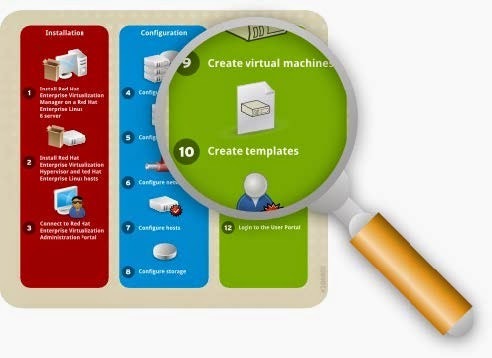 The final stage of setting up Red Hat Enterprise Virtualization is the virtual machine lifecycle - spanning the creation, deployment and maintenance of virtual machines; using templates; and configuring user permissions. This chapter will also show you how to log in to the user portal and connect to virtual machines. clone, or from scratch. Once created, virtual machines can be booted using ISO images, a network boot (PXE) server, or a hard disk. This document provides instructions for creating a virtual machine using an ISO image. In your current configuration, you should have at leasTone host available for running virtual machines, and uploaded the required installation images to your ISO domain. 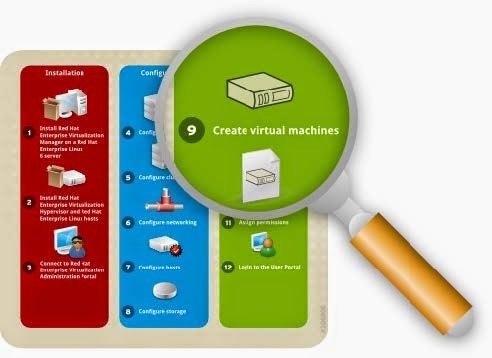 This section guides you through the creation of a Red Hat Enterprise Linux 6 virtual server. You will perform a normal attended installation using a virtual DVD. Navigate to the Tree pane and click Expand All. 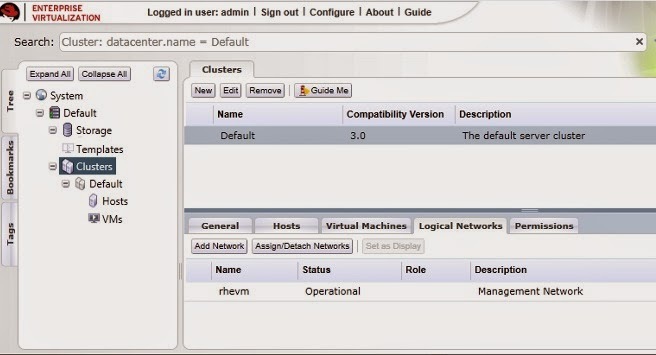 Click the VMs icon under the Default cluster. On the Virtual Machines tab, click New Server. Operating System . You may alter other settings but in this example we will retain the defaults. 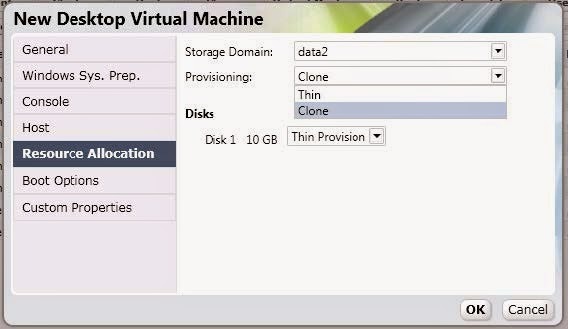 storage disks to the virtual machine. 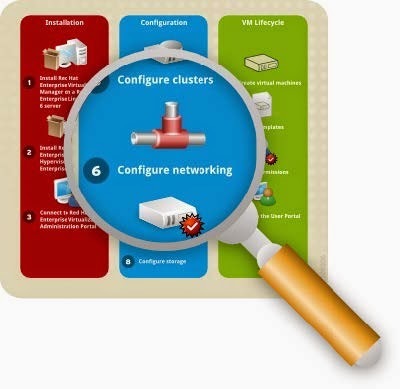 Click Configure Network Interfaces to define networks for your virtual machine. The parameters in the following figure are recommended, but can be edited as necessary. When you have configured your required settings, click OK.
be edited as necessary. When you have configured your required settings, click OK.
display in the Virtual Machines tab. virtual machine, install an operating system on it. 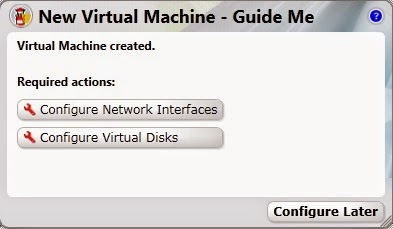 Retain the default settings for the other options and click OK to start the virtual machine. the virtual machine, allow the installation of the Spice Active X and the SPICE client. again. This displays a window to the virtual machine, where you will be prompted to begin installing the operating system. After the installation has completed, shut down the virtual machine and reboot from the hard drive. You can now connect to your Red Hat Enterprise Linux virtual machine and start using it. 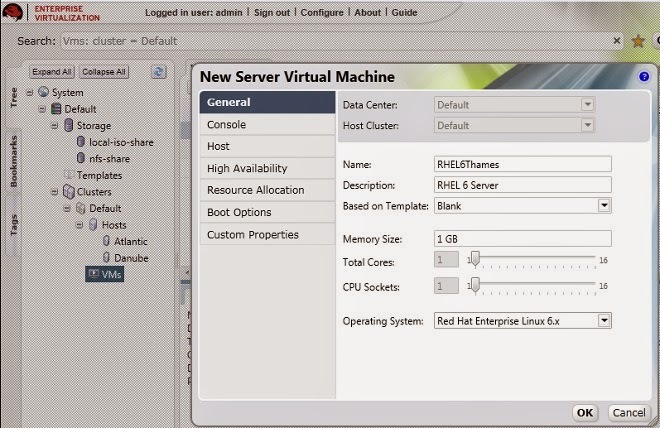 You now know how to create a Red Hat Enterprise Linux virtual machine from scratch. 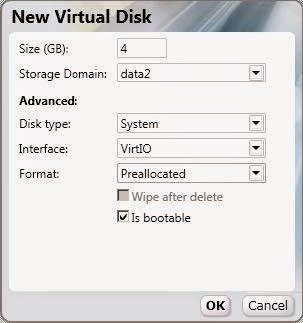 The procedure of creating a Windows virtual machine is similar, except that it requires additional virtio drivers. This example uses Windows 7, but you can also use other Windows operating systems. You will perform a normal attended installation using a virtual DVD. On the Virtual Machines tab, click New Desktop. storage to the virtual machine. See Figure 4.5, “New Virtual Disk configurations” for details. machine, where you will be prompted to begin installing the operating system. The installation process commences, and the system will reboot itself several times. Back on the administration portal, when the virtual machine's status changes back to Up, right click on it and select Change CD. From the lisTof images, select RHEV-toolsSetup to attach the Guest Tools ISO which provides features including USB redirection and SPICE display optimization. Click Console and log in to the virtual machine. Locate the CD drive to access the contents of the Guest Tools ISO, and launch the RHEV-toolsSetup executable. After the tools have been installed, you will be prompted to restart the machine for changes to be applied. You can now connect to your Windows virtual machine and start using it. Now that you know how to create a virtual machine, you can save its settings into a template. This template will retain the original virtual machine's configurations, including virtual disk and network interface settings, operating systems and applications. You can use this template to rapidly create replicas of the original virtual machine. 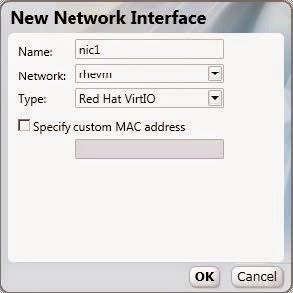 To make a Red Hat Enterprise Linux virtual machine template, use the virtual machine you created in Section, “Create a Red Hat Enterprise Linux Virtual Machine” as a basis. Before it can be used, it has to be sealed. This ensures that machine-specific settings are not propagated through the template. Enterprise Linux 6 virtual machine. Ensure that it has a status of Down. Click Make Template. The New Virtual Machine Template displays. 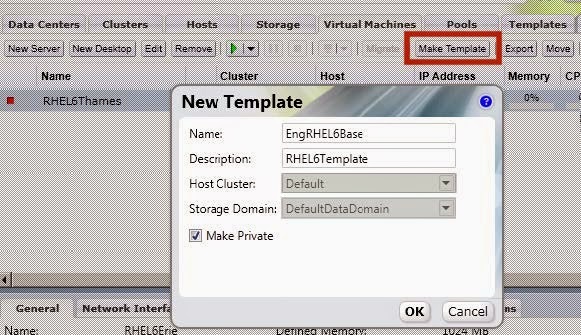 Host Cluster: The Host Cluster for the virtual machines using this template. Make Private: If you tick this checkbox, the template will only be available to the template's creator and the administrative user. Nobody else can use this template unless they are given permissions by the existing permitted users. template is ready for use. In the previous section, you created a Red Hat Enterprise Linux template complete with pre-configured storage, networking and operating system settings. Now, you will use this template to deploy a preinstalled virtual machine. inherited from the template in the resTof the fields. You can change them if needed. menu and select the Clone option. displays in the Virtual Machines list. “Create a Windows Virtual Machine” as a basis. Before a template for Windows virtual machines can be created, it has to be sealed with sysprep. This ensures that machine-specific settings are not propagated through the template. Note that the procedure below is applicable for creating Windows 7 and Windows 2008 R2 templates. Tick the Generalize checkbox if you need to change the computer's system identification number (SID). virtual machine. Ensure that it has a status of Down and click Make Template. Make Public: Check this box to allow all users to access this template. the action buttons are enabled and the template is ready for use. You can now create new Windows machines using this template. Section, “Create a Windows Template”. Select the existing Windows template from the Based on Template list. Enter a suitable Name and appropriate Description, and accept the default values inherited from the template in the resTof the fields. You can change them if needed. displays in the Virtual Machines list with a status of "Image Locked" until the virtual disk is created. Console button to connect to the virtual machine. You have now learned how to create Red Hat Enterprise Linux and Windows virtual machines with and without templates. Next, you will learn how to access these virtual machines from a user portal. Now that you have created several running virtual machines, you can assign users to access them from the user portal. 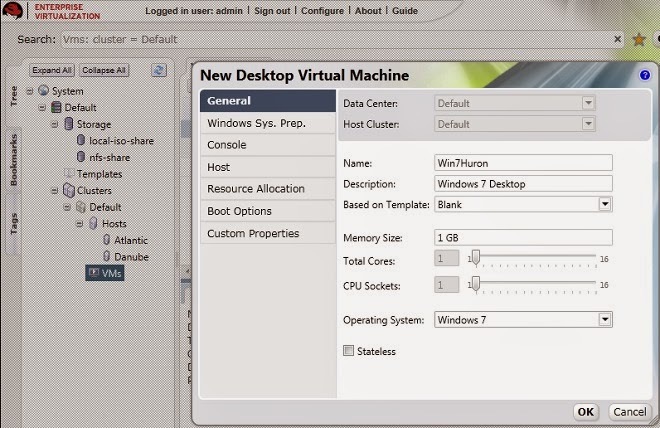 You can use virtual machines the same way you would use a physical desktop. 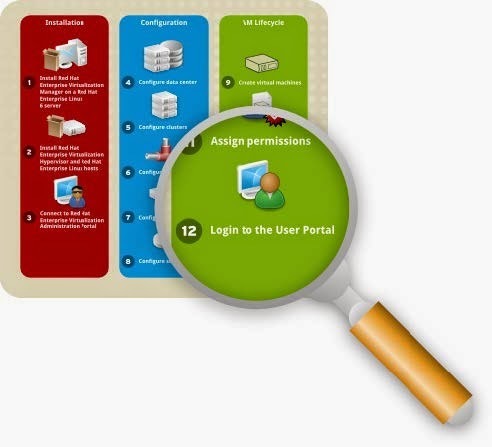 customized permissions for each system component can be assigned to different users as necessary. On the Virtual Machines tab, select the virtual machine you would like to assign a user to. On the Details pane, navigate to the Perm issions tab. Click the Add button. the Search textbox, and click Go. A lisTof possible matches display in the results list. role to user list and select PowerUserRole. Click OK.
need is a Linux client running Mozilla Firefox or a Windows client running Internet Explorer. Open your browser and navigate to https://Dmain.exam ple.com :84 4 3/UserPortal. The login screen displays. Enter your User Name and Password, and click Login. using them. This portal is ideal if you are a system administrator who has to provision multiple virtual machines for yourself or other users in your environment. everyday users who do not need to make configuration changes to the system. Enterprise Virtualization operations. You can further customize your own unique environment based on your organization's needs by working with our solution architects. On the results list, the Storage Type column displays the type you should add. 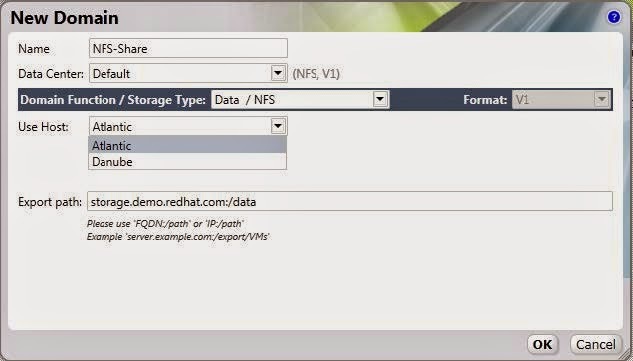 Dmain Function / Storage Type: In the drop down menu, select Data → NFS. The storage domain types not compatible with the Default data center are grayed out. After you select your domain type, the Export Path field appears.